Allergies can really play havoc with your life, so wouldn’t it be great to find some sort of allergy relief that can make your life better. It is not only the constant sneezing, the itchy red eyes, headaches, postnasal drip, and the runny and irritated nose that can drive you up the wall and prevent you from getting a proper night’s sleep, but allergies are also one of the snoring risk factors. So, you cannot sleep properly because of your allergies, and your partner cannot sleep properly because of your snoring caused by your allergies. It’s going to be another long night. Luckily there are some natural allergy cures that can help, which I will deal with in this article, but I will also briefly highlight the main medicinal help that is available to stop allergy symptoms. Allergies start when your body comes in contact with allergens and assumes it as a threat. Your immune system ‘comes to the rescue’ and attacks the allergens by means of the IgE antibody, which results in you then getting the typical allergy symptoms of sneezing, itchy eyes, runny nose etc. Allergies affect each person in different ways, so different people can experience different symptoms for the same allergen. At the same time, people’s tolerance of allergies is different. Some people ‘outgrow’ their allergies, while in other cases their allergies gets worse over the years. Allergies can go unnoticed for a long time, until a reaction to a second allergy set off the first allergy as well, and you are then stuck with multiple allergies. Allergies are serious and should not be ignored. If you experience any allergy symptoms, find out what’s to blame and take it from there, and don’t hesitate to seek medical advice, because allergies can lead to more serious health conditions. More serious symptoms could include diarrhea, chest pains, face swelling, dizziness, nausea, difficulty breathing and more. Consult your doctor if you experience any of these symptoms, or if you are not sure what the cause is. There are many things that can actually cause your allergies, some of which I list below, and you have to determine which of these are to blame in your case. Once you have determined which one or which ones are causing your allergies, you can move to the next step of finding an allergy relief that could cure or alleviate your symptoms for good. It does not matter what the cause of your troubles are, there are things that you can do to make it better. Generally when people get allergies, the tendency is to get some nose spray. This is all fine and dandy but will it not be wiser to find the root of your allergy problems before you consider the medicine route. Your first option after identifying possible allergy causes should actually be to stop the cause and thereby maybe actually finding a future prevention. Avoid going outdoors mid-morning to mid afternoon to reduce you’re pollen exposure. Other pollen advice is to wear sunglasses and a mask in the garden, and to change your clothing and take a shower when you go indoors. Keep windows and doors closed in pollen season, and ensure your car window is closed while driving. Try to not hang washing outside to dry. Do not allow your pets to sleep on your bed, or even in your bedroom. Vacuum your carpets and bed regularly, try to use a good modern vacuum cleaner. Clean furniture and surfaces in your house regularly to avoid allergen built up. If you suspect that certain foods and medication negatively affects you, get a test done to determine what foods and medicine you are allergic to, and avoid them. Consider hypoallergenic pillows and bedding. If you have an air conditioner, ensure it is serviced regularly to keep its air filtration system in good working order. Some clinical studies shows that certain foods that contain probiotics can actually alleviate some allergy symptoms, so try eating more yogurt and other milk products that contain probiotics, and see if that helps. If you have to take the medicine route, over the counter antihistamines may be your best bet, as it can give quick relieve. 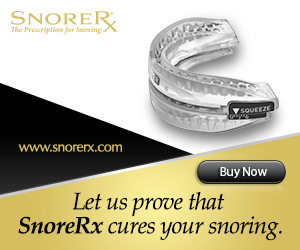 Avoid using this long term though as it can have some nasty side effects, which includes increased snoring. Other medicines that you can try are nasal decongestant sprays and pills, and if you have to go extreme there is also stronger steroid nasal sprays that can help. Ensure you consult your doctor to get the right medicine for you. Armed with this information, you should not hesitate to find the cause of your snoring and then find a cure for it. Your aim should be to work towards finding a block for your allergies, to prevent it from even happening, and if it does happen to have a quick fix in place. You can also carry a bottle of nasal spray with you, if you choose, for that moment you need a quick fix. Your partner will thank you for the quite nights if you do manage to cure your allergies. Do not hesitate to seek medical advice, because allergies can be serious and can lead to more serious health conditions if not treated properly. Remember an allergy relief is only effective if it provides long lasting relieve. So, what helps with your allergies? If you found this information helpful or if there is something you want to add, please be so kind as to leave a comment below this article.